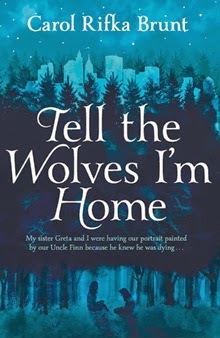 Review: This is an emotional, well-written story about family, friends and loss. AIDS is a tough topic and as a young child in the 80s, I remember hearing many of the things expressed in this book by a few characters (what if you get it from kissing? etc). Although this book was not marketed as YA, it reads like one. The book follows June, a young high school student who has no friends except her beloved uncle. When he dies, she feels very isolated. Like most YA books, the parents much disappear in order for the characters to discover themselves. In this case, they are CPA's in tax season, which allows June and her older sister to run around town completely unsupervised. While the primary focus of the book was June and her late uncle's boyfriend Toby, I was more interested in June's relationship with her sister. It was very realistic and while many of their interactions were unsettling, I couldn't wait to see how they would end up at the end of the book. June's relationship with Toby was a little odd. I understand that they needed each other to heal, (and I was not creeped out by June's feelings toward her uncle although I can see how many readers would be turned off by it), but it just didn't seem realistic to me that he had ZERO friends in the city. He was with a very charismatic, famous painter for years, it seems like he would have had some friends. I also found it strange that he would give June alcohol and cigarettes. It was established that he thought she was a year older than she actually was, but for someone who sneaking around with a minor, this was strange (maybe people were more relaxed about such things in the 80s? I'm not sure). I really enjoyed this book but the ending seemed very rushed. June's sister's storyline was especially disappointing (I thought something was happening with the theater director) and her sister driving into the city in the middle of the night with a permit was very realistic with anyone familiar with NYC. That being said, I was very emotional at the end of this book (I finished this at Starbucks one night and a random man near me asked what I was reading because I seemed so engaged with it). Overall, it wasn't perfect but I really enjoyed it.